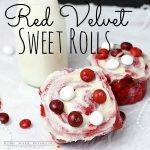 Red Velvet Sweet Rolls combine red velvet cake, chocolate, and cream cheese frosting into one amazing breakfast treat! Add luke warm water to a large bowl and sprinkle the yeast packets over it. Let yeast sit for 5 minutes. When the yeast becomes foamy add the Red Velvet cake mix, vanilla and salt. Stir mixture together and then slowly begin adding the 5 cups of flour, one cup at a time. Use your hands to knead the dough into a round ball. Once the dough has risen, knead it back into a ball, and cover it once again to let it rise for another hour. When the dough is ready use that last cup of flour to lightly dust your work surface with flour. You may also need to add some flour to the dough if it is sticky. You want to be able to work with it without it sticking to your hands. Roll the dough into a rough rectangle, about 1/4 inch thick. Pour melted butter over the dough , leaving a little space around the edges. Mix the brown sugar and white sugar then sprinkle the sugar mixture over the butter. Sprinkle the crushed M&M's® over the brown sugar. Starting from the far side, roll the dough toward you. Make sure to keep the roll as tight as possible. Once it is rolled up pinch along the seam to seal it. Use a knife to mark the roll at 1 inch intervals. Then cut the dough into rolls. Place the rolls in a buttered 9" x 13" baking dish (you will need 2). Place the baking dish in a warm place and let the rolls rise for about 20 minutes. While they are rising preheat the oven to 350°F. Once rolls have risen place them in the oven and bake for 15-20 minutes or until a toothpick comes out clean. When they have finished baking spread 1/2 of the frosting over them while they are still hot, letting it melt into them. Let them cool completely and then spread the remainder of the frosting on them and sprinkle them with M&M's® Red Velvet. *If my kitchen is cold I often heat the oven to 200°F and then open the door and let it cool down. When it is just warm I sit the bowl inside the oven with the door open. Using a mixer combine cream cheese, powdered sugar, vanilla, and milk. You want the frosting to be a thick but easily spreadable consistency. Add more milk if needed.